Your perfect Wine and Dine Experience! The informative Sonoma Wine tour offers a taste of superb wineries in Sonoma County and the Carneros region. Take in the splendor of picturesque vineyards while a minibus escorts you from San Francisco across the Golden Gate Bridge. The 6-hour itinerary includes two to three winery visits. In addition you will receive $25 card towards your dinner in more than 50 San Francisco restaurants. Start your 6-hour tour with pickup at your San Francisco hotel or Fisherman's Wharf. 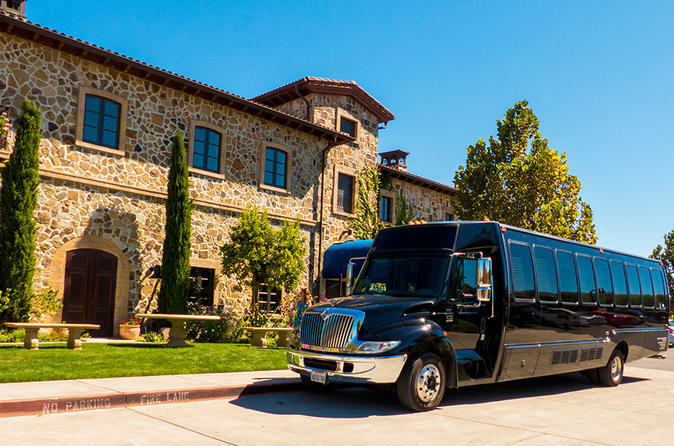 Anyone who enjoys a good glass of wine will appreciate this day trip from the city to the town of Sonoma and the world-famous Carneros wine region. Depart around midday and head north across the Golden Gate Bridge by minibus, arriving at the Sonoma Plaza. You're guided to two or three unique Sonoma wineries, which span from mass-production vineyards to smaller, boutique operations and tasting rooms. Wine tasting fees is included at one locations with the option to purchase additional tastings. After you sip and savor, relax on the return drive with drop-off from your starting point. In addition you will receive $25 card towards your lunch or dinner. You can pick from more than 50 restaurants in San Francisco and beyond where you can use the card. Minimum purchase amount might be required.